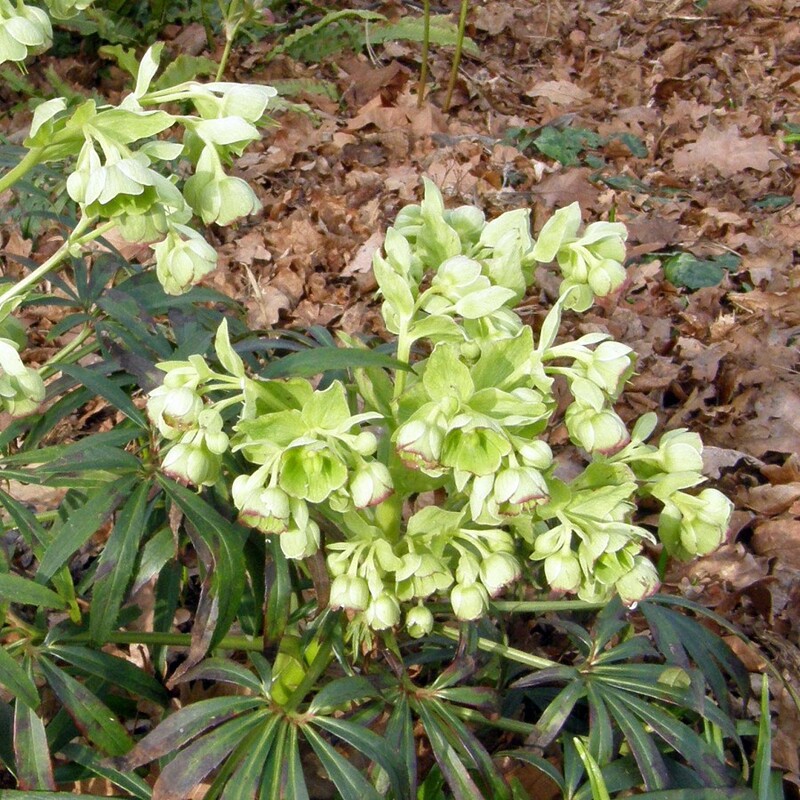 Not just a botanical insult the Stinking Hellebore is actually one of the least stinky of the foul-smelling plants. This shade loving perennial gets its name not from a foul flower but rather from the stinky smell when the leaves are stems are crushed. The classic variety of this Euro-and English native (also parts of Greece and Asia Minor) sports a pale green to yellowish-white, fice petaled flower but can even have purple edging. Hybrids commonly sold today include deeper purple flowers. A European herb, the stinking hellebore, is the only plant discovered so far that relies on another organism to generate heat for it. Other plants, like the famous “corpse flower” whose blooms smell of rotting flesh, warm up by breaking down salicylic acid, or by tracking the sun’s movement. Plant in your garden in shade to part sun, this is a hardy and lovely addition to any garden. Grows to about 18″-24″ high and about as wide. Generally hardy to about 10 °F but I am told this can survive below zero in the right, well mulched and established garden bed. Moderate water. Great pollinator attractor, especially bees. All parts of the plant are poisonous, causing violent vomiting and delirium. Ethnobotany, especially in the regions of Southern Italy, suggests that the poisonous qualities were used in folk medicine, including as an abortifacient. Decoctions of the leaves can be used as a topical treatment against parasites and fleas. The root of the plant is a heart stimulant. H. foetidus is one of more than a dozen similar flowering perennials that belong to the Helleborus genus, with flowers that vary from white to pink to deep purple, nearly black. Check out hellebores.org for everything you ever wanted to know about hellebores!